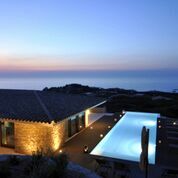 Retreat with Lisa Valentine yoga in this beautiful luxury Villa. Yoga, meditation and massage, directly beside the turquoise blue sea, in a natural reserve on the northern coast of Sardinia. 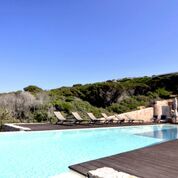 Enjoy soothing silence during your retreat and relax in nature of Sardinia. Regenerate yourself during a sensitive massage or a yoga class on the large terrace with sea views, enjoy Watsu in our swimming pool situated in a lounge garden, or listen to the waves on beautiful rocky cliffs right outside the front door. Our in-house, Sardinian chef will spoil us exclusively with tasty Mediterranean dishes. Visit local towns, villages and beaches or simply just relax with your whole being into a deep silence and let your soul connect to the wholesome spirit of the magical island of Sardinia. It is 10 walking minutes to the first sandy beach. 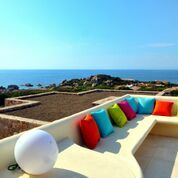 The villa is located directly on the sea on a rocky coast in the middle of nature. Totally relax in peace in the evening, as there is no urban entertainment nearby. It is rather an inner retreat at the villa, since there are no distractions from the outside world..